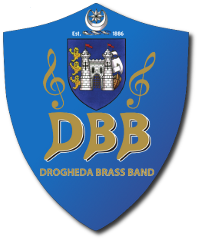 The Drogheda Brass Band’s School of Music aims to make the often expensive area of music education fun and affordable for young people in Drogheda and its environs, while striving to obtain the highest standard of education possible. Students receive all instruments, music, books and tuition required to sit internationally recognised grades with Trinity College London. Providing this equipment and tuition gives students an opportunity in music that they might not otherwise be able to afford, while the Drogheda Brass Band also organises the grade exam, bringing in certified examiners from Trinity College London. Students enjoy regular workshops with professional players. They also play at concerts and competitions in various parts of the country and occasionally abroad. While we charge a small membership fee we aim to reduce costs where possible. All our brass teachers are volunteers and we fund-raise through flag days, church gate collections and street collections. Past members have gone on to make a career in music either as teachers, musicians or composers. Our most famous alumnus is Dr Richard Rock. If you wish to enquire about joining our School of Music please contact us here.